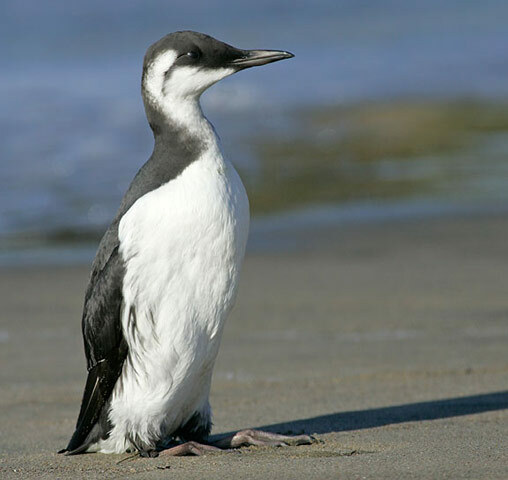 Common Murre: Breeds along the Arctic and subarctic coasts south to central California and the Gulf of Saint Lawrence. Spends winters south to southern California and Massachusetts; also in Eurasia. Preferred habitats include rocky coasts. Common murres can fly 200 kilometers from the nest to find food for their chicks, and may dive as deep as 100 meters for food. 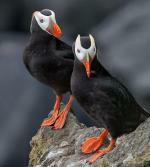 Courtship displays including bowing, billing and preening. The male points its head vertically and makes croaking and growling noises to attract the females. The eggs vary in color and pattern to help the parents recognize them, each egg is unique. The Common Murre is distributed throughout the low Arctic and boreal waters in both the northern Pacific and northern Atlantic oceans. 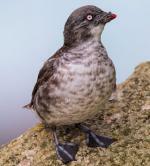 In North America, this species may also be called the “Thin-billed Murre”. 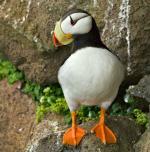 These birds only stay on land to breed, which typically takes place on rocky cliffs and islands. They breed in colonies, and do not build a nest for the young. 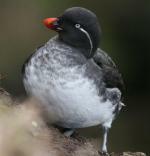 During the winter, northern populations migrate to more temperate climates. They dive underwater in order to catch worms, squid and crustaceans, and have been known to swim distances of 160 feet. The conservation rating for the Common Murre is Least Concern.